Here’s the ultimate reason why do the things we do: So that future generations can enjoy and learn about the machinery that made possible so much of what they enjoy. 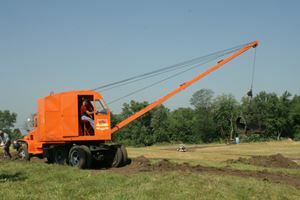 Schneider Farms & Excavating owns this 1969 International Harvester TD15B, which is equipped with an inside-mount dozer and a rear folding boom. 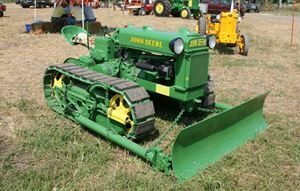 This 1947 Deere Lindeman BO Orchard tractor was part of a collection of Deere tractors shown in the HCEA area by Cass Flagg and Hyler Bracey of Taylorsville, Georgia. 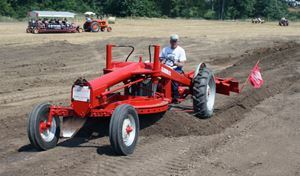 This 1954 Ingram five-ton three-wheel roller is part of a small fleet of machines used by the I & I Club to maintain their tractor pull track. This crane is a 6,000 lb. 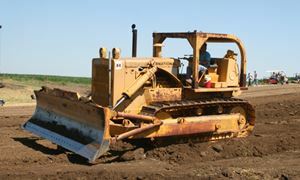 capacity Hughes-Keenan Roustabout, owned by Schneider Farms & Excavating. 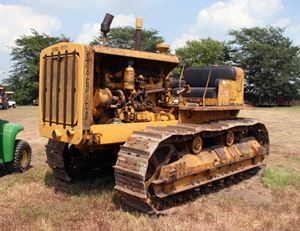 Albert Warner owns this 1934 Cat Diesel Fifty. 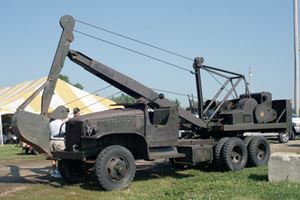 Calvin Kooiker’s 1947 Schield Bantam M47 truck dragline on the job. You don’t have to go fast to raise dust! Dave and Jan Metcalf’s Adams No. 4 Patrol gives these horses a little exercise. 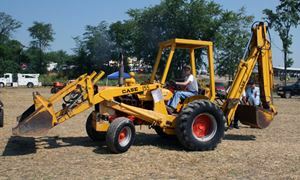 The Allis-Chalmers D motor grader was the most numerous machine at the 2011 show. 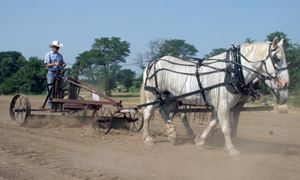 This one owned by National Director Jim Schaus and operated by fellow National Director Dean Wack, dates to 1949. 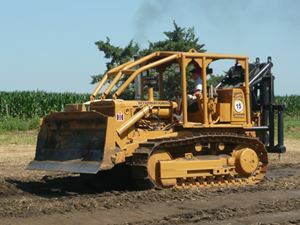 Mike Rohleder owns this very rare 1951 Schield Bantam ABM51 truck backhoe. It was designed for airborne engineer service; it had no cabs on the truck or the carrier to conserve weight and space. 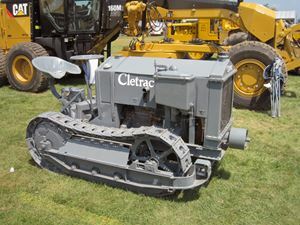 This is a 1924 W from David Rexing’s display of Cletrac tractors and artifacts. 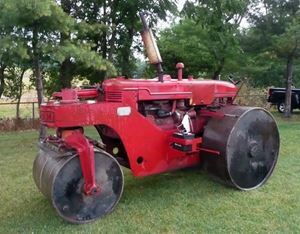 In the 1950s and 1960s, the Seaman companies produced a line of rollers that combined pneumatic tires and a full-width steel drum, drawn by an International prime mover. 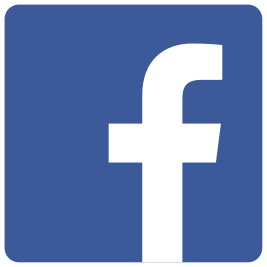 This example is a Duopactor. 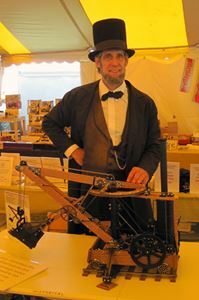 Abraham Lincoln (portrayed by reenacter Randall Duncan) was quite impressed to see a machine from his time, the HCEA’s 1:10 scale model Otis steam shovel! 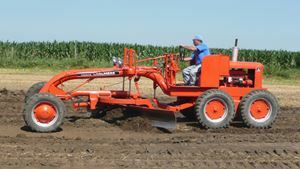 Here’s a rare piece: A 1951 Ford 8N with a motor grader conversion and rear berm leveler. 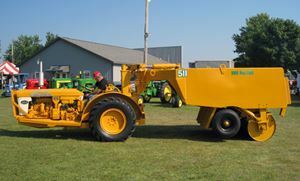 Both attachments were built by Meili-Blumberg (today’s M-B Companies) for Ford’s Dearborn Implement Division. 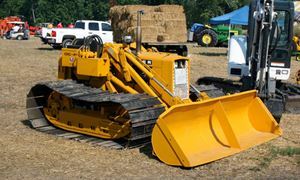 Three Oliver OC46 crawler loaders were at the show, and this was the most unusual – a 1962 model set up with wide tracks and bucket for snow loading. Chade Dulle of Trenton, Illinois, owns it. 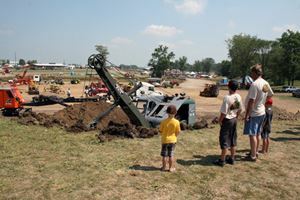 Few machines at HCEA shows can match Albert Warner’s International TD25 in fewest hours per year of age. From appearances it predates the 1968 TD25B, and it has less than 300 hours! 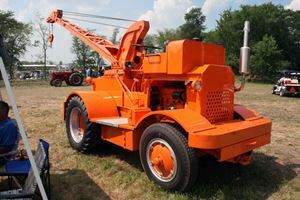 Lessman Engineering Company of Des Moines, Iowa, began developing front-end loaders in 1916. 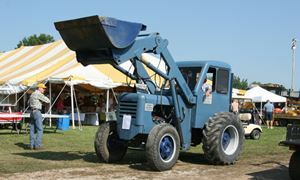 It furnished loader attachments for Fordson tractors, and went on to build integral loaders like this one. 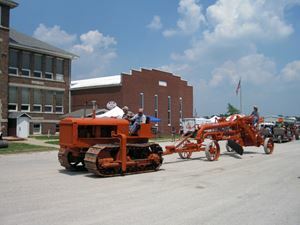 Edward Staubaugh’s Allis-Chalmers outfit, consisting of a 1938 L tractor and 1940 112 grader, leads the way in the Saturday parade through the show grounds. 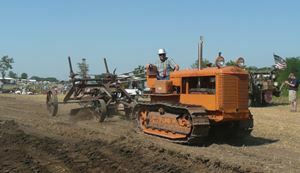 Board Chairman Dave Geis works the clay with his 1947 Cletrac DG and 1929 Cat 15 pull grader.